Red Sister is book 1 in the Book of the Ancestor series. I grabbed this audiobook during one of the Audible sales and I'm so glad I did! I wound up devouring both audiobooks in this trilogy that are out currently and I'm eagerly awaiting the last one that releases in a few weeks. This is a Fantasy novel full of killer nuns and magic, you're going to want to grab it. We start out following a young Nona Grey, who was given up from her village to a man that buys children to sell them for a profit later. She winds up getting sold, and it doesn't take long before she acts out and after nearly killing a man, winds up about to be executed. A nun comes to her rescue and takes her to go live and learn at the Convent of Sweet Mercy. These girls (aka novices) at Sweet Mercy are raised to be killers and how to harness their abilities. Nona makes a few friends and gains a much better understanding of how to fight. It's a good thing she is learning fast because she's going to have to put her skills to the test or wind up dead. This novel at times is dark and full of violence and I couldn't seem to get enough. Each book focuses on Nona, but as the novels progress you're noticing years have been passing and you're watching her grow. 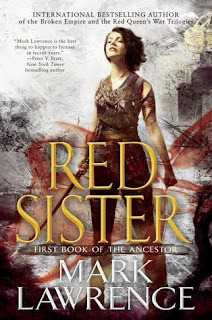 Red Sister is a must read for Fantasy lovers with strong female leads. I got vibes of Arya Stark from Game of Thrones while reading this. Nona has such determination and has gone through a lot in her young age. She is a force to be reckoned with though and I was cheering her on along her journey. The plot is unique, the characters interesting and I think any Fantasy enthusiast will love this trilogy.